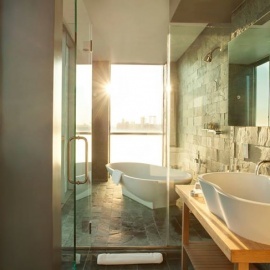 Soaring 20 stories above the historic tenements of the Lower East Side, Hotel on Rivington is a luxury boutique hotel with sleek, modern design and breathtaking views. An urban oasis, the 108-room hotel is within steps of New York City's best restaurants, entertainment, art galleries and shopping districts. The hotel offers rooms starting at 385 square feet of usable living space, many of which feature unique amenities such as balconies, soaking tubs, steam showers and floor-to-ceiling glass walls. Hotel on Rivington is home to on-site food & beverage and event spaces Café Medi, JIA Lounge, S'zen and Penthouse on Rivington. 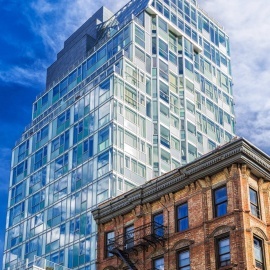 Hotel on Rivington is an urban oasis with a sleek modern design, stunning skyline views and spacious accommodations that exceed New York City hotel standards.